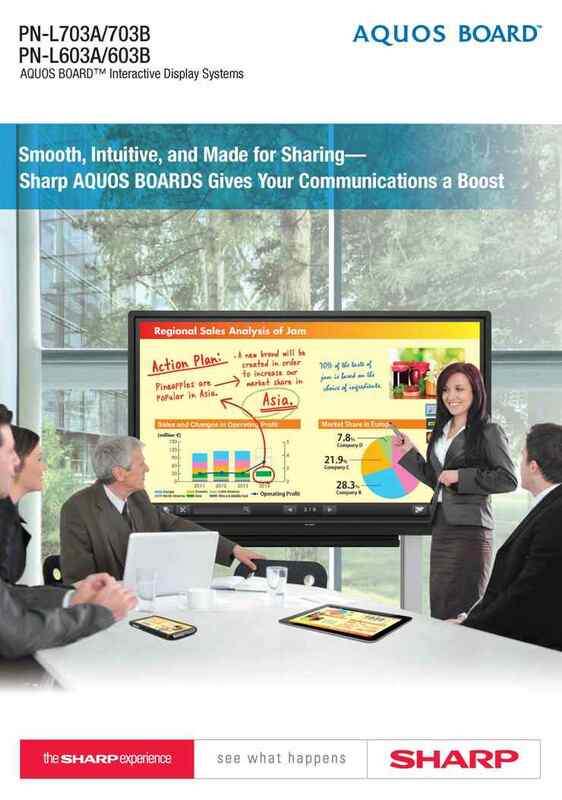 Sharp's AQUOS BOARDTM PN-L703A/703B/603A/603B are designed for smooth and effortless communication in a wide range of contexts. Their highly responsive touch pens allow several people to write on the same screen at the same time. And Sharp’s Touch Display Link software enables multifaceted wireless communication. Whether in the boardroom or the classroom, Sharp changes the way you communicate. Recognizing up to 10 points of contact, the PN-L703A/703B and PN-L603A/603B multi-touch LCD monitors allow up to four people to write on the screen at the same time using touch pens or fingers. Participants can take an active part in meetings, brainstorming sessions, classroom interactions, and more. Discussions and presentations become platforms for effective and lively exchanges of opinions. Using a touch pen, you can easily launch and display the Pen Software user interface—a menu comprising of smartly arranged icons that provide easy access to pen settings and functions. Each touch pen has its own dedicated menu, which can be displayed even when up to four people are writing on the screen at the same time. Pen settings such as colour and line thickness can be set for each touch pen (with function buttons). These LCD monitors feature a handwriting recognition*3 function for converting selected onscreen handwriting into standard text. This convenient function allows you to utilize onscreen content to make neat and legible minutes of your meetings.